Adobe’s consumer video editing program Premiere Elements is back for the 12th round in the battle to be the home video editing champ, and this version has some powerful new features that make it a strong contender for the prize. Premiere Elements has often been viewed as a cut-rate version of Premiere Pro, inheriting pro features a couple of versions old. That’s not a bad thing, though, as Premiere Pro is one of the most powerful professional video editing programs available. With version 12, Premiere Elements gets sound effects, a dynamic soundtrack, and a new motion-tracking feature from its big brother. The interface gets a makeover as well, with the addition of a guided mode (like its sibling Photoshop Elements) alongside the quick and expert modes. The Elements Organizer can be accessed from within the editor to load files. New to Premiere Elements—though old hat for on Photoshop side—Guided Mode takes you through nine common tasks such as importing a video, adding a soundtrack, and trimming clips. It does a good job for the novice video editor, highlighting the correct buttons in the interface to avoid flipping between windows. It would be nice to have even more guided tasks available, though: things like the motion tracker and saving the finished video are not covered. 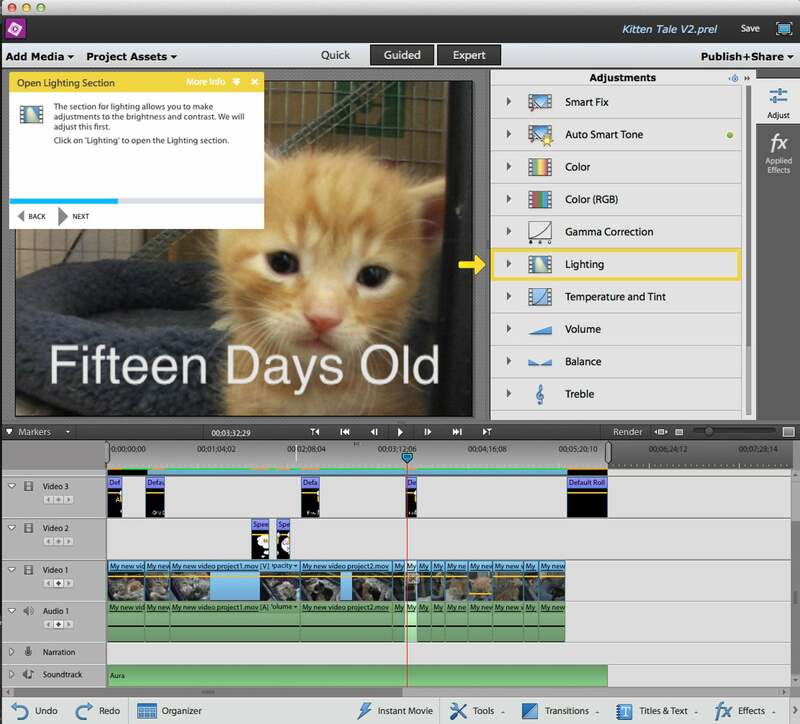 Other parts of the interface are mostly unchanged from Premiere Elements 11: and those users will feel right at home. The additions to the audio features are also useful. This version adds a wider range of cartoon and other sound effects, plus a soundtrack feature that creates a custom music track from 52 scores in 7 categories that are included (the program downloads them only when you use them to save space). When you create a score from these, it is customized to the length of your video so that it starts and ends properly, and the level is adjusted for the sound in the video; a nice touch that makes a video look and sound more professional. The new Guided Mode takes you step-by-step through several features of the program, but not some of the more complex tools. The new motion tracking feature is also easy to use: Just drag a box around the object to track in the video, and the program tracks the object as far as it can in the clip. You can then attach an image or graphic to this track, which makes it easy to add cartoon speech bubbles or effects that follow someone on screen. It lacks the sophistication of the Premiere Pro tracker, though; there's no control over the tracking process and no ability to tweak the path after the tracking is done. If it isn’t quite right, all you can do is scrap it and start again. In addition, there are tweaks to the video effects. These include the addition of what Adobe calls Hollywood effects, but which are mostly cheesy looking. The only ones that might find some use are the FilmLooks, which tweak colors for a motion picture style. Presumably to avoid licensing issues, these are called things like Trinity (for a Matrix green look), Sparta (a 300 muted color look), and Pandora, which turns skin tones (or ginger cats) blue. Unless you are producing an Avatar fan film, this is best left unused. The same is true of most of the included templates. The Pandora filter turns your family (or ginger cats) into blue-skinned aliens. Will James Cameron sue? Probably not, but we doubt he will be using this on the Avatar sequels, either. One fine feature though, is the Auto Smart Tone, a filter that tweaks the video to look better by adjusting the contrast, color, and gamma. It did a nice job on several dull and gloomy clips, boosting the color to more usable levels without overdoing it. It would be nice if you could apply this to an entire movie, but instead you have to apply it to each individual clip: a rather tiresome business for complex videos. You can, however, apply most of the other effects to an entire movie by putting them into an adjustment video layer—like a Photoshop adjustment layer. While generally I found this version of Premiere Elements easy to use, there were a few irritations. For example, I found that using the timeline to find a specific spot in a video was difficult: when moving through the timeline, the on-screen preview would often lag behind by a second or two, especially when effects were applied. Other programs get around this by generating previews while the computer is idle: but to get a smooth preview in Elements, you must render the preview files by clicking on the render button. Elements doesn't use the GPU to accelerate creating previews and effects the way other programs—like Premiere Pro and Final Cut Pro—do. Adobe Premiere Elements 12 features some interesting new tools, but they aren’t compelling enough to make this version a must-have for owners of previous versions (the upgrade costs $80). But those who are just starting out in video editing, or are looking for a step-up from the lightweight iMovie will find a good home in Premiere Elements 12: this $100 program (or $150 when bundled with Photoshop Elements 12) offers a good balance of features and ease of use, providing powerful tools without overwhelming users with choices.